Before Heart of the Swarm, there were mentions about how the scene of StarCraft II was ‘dying’; an unclear term as to what extent the eSports competition of StarCraft would dissolve to. While no one denies that the height of StarCraft II has passed after the mid-season of 2012, it’s important to note that some parts of the scene are, in fact, at a decline while others are just the natural filter of a growing subculture. The need to highlight what is worrisome and what is a natural filtered growth of StarCraft II can help create proper direction in terms of focus and urging for future endeavors in those specific fields. For the past two or three months, I have been thinking about writing something about StarCraft’s situation overall. Actually, since Travis from League of Legends, mentioned, minorly, about how StarCraft is dying (six months ago) and in relation to how people are jumping ship to produce content for League of Legends; I have always wanted to magnify how StarCraft is coming down from its height of new content, personalities and organizations. In October and November, I noted how we were oversupplied on tournaments, new content and a lack of rotation in terms of progaming champions. Now we are starting to see new victors (usually from South Korea) but perceptively less tournaments and webshows. When people highlight the state of StarCraft, they often compare it to that of late 2011, as if the people involved and those on the outside, maintain a consistent and constant interest in a game for years on end. This coming and going, both business-wise and in general, is a filtered growth of the scene: it is the narrowing of relevant content and the decline of new events, streams and bad practices. I do think, in a lot of ways, StarCraft can be improved ranging from spread player-exposure, cycling through newer iconic people as well as Blizzard’s policy/approach in being involved with the community. [youtube=http://www.youtube.com/watch?v=VKI01dv4ULw&w=560&h=315] (It starts at 6:15) I suggest you take a listen to it, not all of it is relevant to StarCraft, but his personal concerns are mirrored in all eSports of today and the future. It’s insightful because they were concerns mentioned here or within communities in the past. However, to claim StarCraft II is dying is to overlook the grand scheme of things and to ignore anything from 2010 to now. In essence, just because there is less of something, does not mean there is less popularity or interest. To put into context: despite there being more talk and more support for Dota 2 and League of Legends, does not necessarily correlate to a major decline in StarCraft II. Audiences are not exclusive to games and they are certainly not a limited resource. We’re concluding that the interest of eSports titles has grown. The mix understanding of StarCraft’s actual growth is due, in part, of the organizers who stretched their numbers and overhyped their achievements. It’s easy, in retrospect, to look at where we saw StarCraft going and now realizing that perhaps we exaggerated a bit in our feelings of grandeur. Now with RIOT and League of Legends setting new innovations about creating a standard of competition, eSports financial support (Valve especially here) and backing for their competitors, we can’t help but compare it to that of StarCraft II. The notion of the scene dying is due to the disproportion of players in specific regions and the dropping out of organizations, both big and small. However, these should not be the sole factors to make a basis of the scene’s death and in fact, evidence can claim that the fluctuation of tournaments featuring StarCraft and viewership are not as poor as some describe. When the StarCraft scene compares themselves to other E-Sports, the numbers are lost and the discouraged view of “what could have been” ensues. It’s a common issue where people will compare scenes without taking into circumstances of the separate games’ context and this is amongst the strongest reasons these misplaced ideas propagate into real worries. “What we can say is that SC2 is not dying. The numbers are not going up, clearly, but they are largely stable. Interest in player streams seems to be getting lower, but WCS and other tournaments seem to easily take up the slack to keep the people watching their favorite game.” – courtesy of Conti and his tremendous work regarding Livestream and StarCraft II! I suggest you read all of the topic as there are showings of StarCraft event viewership declining. Make no mistake, StarCraft II is still a major eSport title and will be for many months and possibly years to come. But the ideologies of it continuing to lead the pack in terms of trend-setting and ushering the general audience of traditional entertainment to eSports is definitely not in the cards. In terms of tournaments, from August 2012 to 2013, we’re actually seeing steady numbers of prize-pools (300 to 650k) across the region (less for North-American and more for Europe and South Korea – thanks to WCS) as well as inclusion of StarCraft II at multi-game events (20 to 18 more or less). We’re not in quite as dire situation as some may be lead to believe, we are just not leading the pack anymore and this is normal in a growing subculture. New foundations are always made to further up the expectations and pull for larger audiences. eSports Earnings provides a great tool to compare years of tournaments and player earnings. The graphs may feel incomplete, but we’re mainly interested in the prize numbers for 2013 as well as how many multi-game tournaments still include StarCraft II. What we do see here is less tournament opportunities in place for larger prize-pools by Blizzard Entertainment for each region. So while prize output is good, if not better, the amount of tournaments available for the average competitor is much less. However, without a region lock, we’re seeing a bit of starvation with North-American especially. This starvation of both quantity of major tournaments as well as unlocked regions pushes early retirements for players (fueled by their growing disinterest with the game). How do we distinguish which is filtered growth and which is true signs of the decline of StarCraft? It’s a matter of context. IGN Pro League’s end and Major League Gaming’s redirection are signs of business: one had bad business practices, as anyone can tell you (though great public presentation), and another saw valuable markets to explore (it could be other aspects as well, there’s never one true reason; just a variety of strong justifications). KeSPA’s restructuring to a more open practice is because of the lack of popularity of StarCraft II in Korea, the WCS format that bottlenecked events and thus the need for that many teams in such a small region (eSF + KeSPA teams all for Proleague and WCS Korea [now OSL & GSL]). These are dissected examples that emphasize context to show which areas are suffering and which are simply moving on. What I consider to be filtered growth is mostly based on opinion and perception. 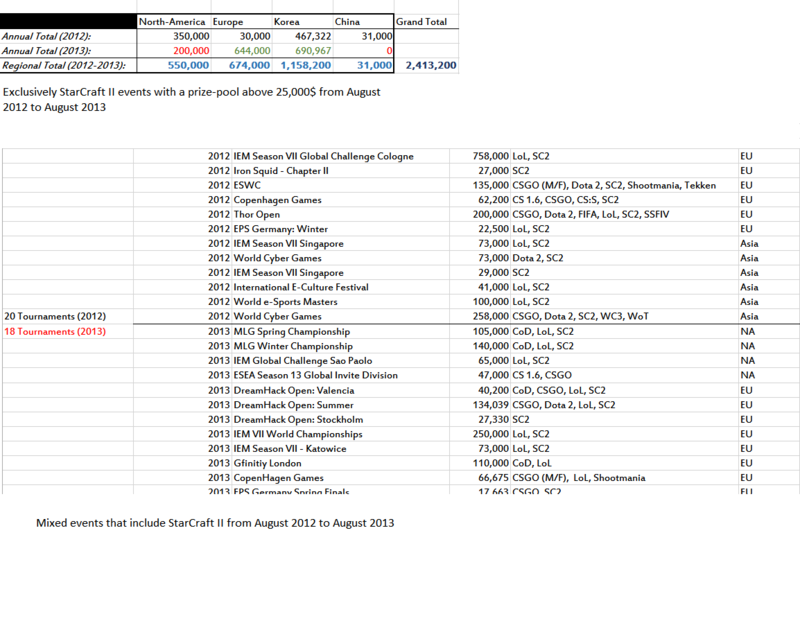 In 2012, we saw leaps and bounds of major production organization and presentation from the big event organizations. DreamHack always impressed me, but NASL and Turtle Entertainment [IEM/ESL] have also set the notch higher. There is an emphasis on presenters, observers (something Dota 2 hasn’t incorporated yet) and hype. Schedule and time organization have improved and attendance numbers are still very, very high. In essence, while StarCraft is readjusting in their new waistline of competitions and competitors, event organizations are setting new standards of professional work. Prize-pool numbers: Not any lower than we may think, just not as scattered across multiple games. I would say the lack of WCS regions within China and SEA (including Oceania) are issues, including the lack of a region lock to prevent a complete failure of a particular region. Blizzard’s position should be to keep all regions plump with healthy competition while relying on the organizers they commission for WCS production, to attract new audiences (as IEM does with Gamescom and IEM NY with Comic-Con). Tournaments: With amount of reserved time WCS takes, to which no other tournament organizers can broadcast simultaneously with, tournament opportunities have shrunk causing many players to reconsider their options; it also causes team organizations to look into new eSports titles that offer a bit more liberty and marketable numbers for their sponsors. Additionally, with game developers taking the reins of their scenes, they are also delegating responsibilities and excluding other organizations from producing content. Think how restricted NASL was with StarCraft II content because of Blizzard’s partnership with MLG? This is mirrored across the world and does put a hinder on new businesses. League of Legends also suffers similarly from this issue. Viewership: I find Conti’s consistent work on the subject gives the best evidence. Within this topic, he notes that there are lower viewership numbers, but also that WCS stands on its own successfully. Overall, numbers are stable since Wings of Liberty (more or less) with events still garnering a huge interest (specifically WCS). In summary, when we saw the strides other eSports titles are hitting, we feel this sense of unaccomplished worth. We compare ourselves to StarCraft of 2009 or StarCraft II of 2011 (Anaheim anyone?) or of Dota 2 and League of Legends. However we never really account for the major flaws of those two games. In many ways, they get things right and take a bigger investment step than Blizzard, but in other forms; the scene still needs growth; similarly with StarCraft. That is not to say that they aren’t doing better than StarCraft, they are just doing things differently and solving areas StarCraft currently suffers from (I’m sure you can think of plenty). Despite this, interest in StarCraft is steady. Declining? At times, but slowly and not looming as near as people may think. It may feel like I’m downplaying the spiraling of this scene, but I rather see it as more of refocusing the factors that matter most and then making note of where we truly stand. Swiftly lead by an impressive beta, the release of StarCraft II’s expansion: Heart of the Swarm brought out many balance changes and UI improvements to the series. High expectations were set on the direction of StarCraft II not only as an E-Sport, but as an entertaining game overall. These expectations exploded during the public disapproval of Blizzard’s lack of public appeal. There was public backlash for their inability in improving the title on a multiplayer and singleplayer level (after so many years of clamoring), also in view of Battle.net 2.0’s long list of criticisms since its implementation. People wanted more and hammered the company for months (even years for some features) begging for utilities that made the game less secluded for the user and more open towards cooperative play such as: additional building blocks to improve the player and enhanced modes both in gameplay and in variety of tools (shared replays, resume from replay, unranked matches, etc). As Heart of the Swarm opened its servers, there was impatience to see how Blizzard could outdo their exciting beginnings of Wings of Liberty, and renew the passion of old followers and fans of the genre (RTS) and scene. In short, they have hit their mark and the expansion delivers what was urged but not without some drawbacks in many areas of the game. StarCraft II: Heart of the Swarm is split into singleplayer and multiplayer, both completely different in value and appeal. In the singleplayer aspect, the players are jumped into the perspective of Sarah Kerrigan, previously the Queen of Blades in Wings of Liberty and is returning once more after an ambush separates her from her two-way unrequited love with Jim Raynor. An arch of vengeance, power struggle and a yearning to be reunited with someone who said he’d never give up on her (doesn’t get more deep than that) are what’s to be expected in this sequel. While the gameplay and missions are definitely just as varied as the missions in Wings of Liberty, the story and dialogue leave much to be desired and can only be compared to that of Star Wars: Episode II. One thing to note is that you will never play any of the other races in the campaign (neither Protoss or Terran). 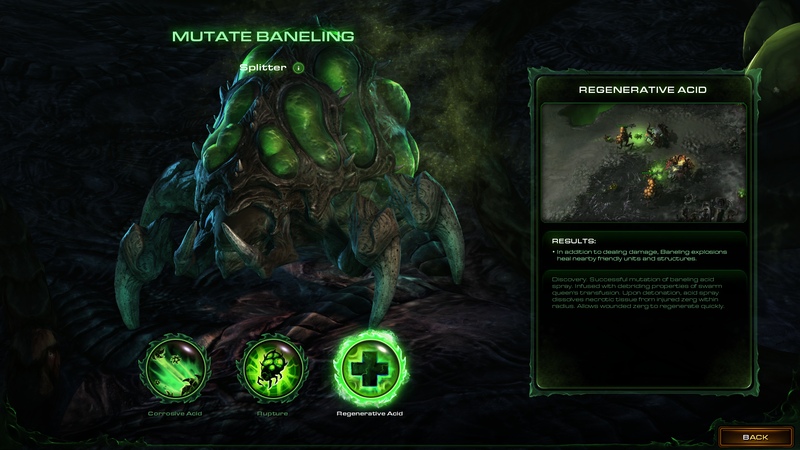 Though many of these “mutations” or customizations cannot be found outside of the singleplayer, truly enhance how to go about completing your missions and keeping in a “Zerg”-style way. Pretty impressive stuff. There are many cinematic scenes like this, even more action-packed than ever before. On the multiplayer side, since Wings of Liberty, “improving” would be the summation here. Ranging from AI difficulty levels, builds and diverse game mechanics towards various ranked/unranked matchups really lets the player make the game as serious or jokingly as they want. The welcoming of new units definitely refreshes the game and creates new scenarios and approaches towards winning for the player (though the question of if its balance is still arguable). Free-for-all mode is still lacking in terms of maps and uniqueness though the arcade feature still has some amazing games both promoted by Blizzard and the community themself. The varied custom games navigation and UI, however improved, still leaves a lot to be desired, especially in finding something beyond the top ten most popular custom games (and searching those who want to play it). The tools brought into Heart of the Swarm are what really make those still hesitant to return, reconsider going back to the game. The options menu has expanded to having more graphical options, customization of hotkeys (hotkeys for the singleplayer do not overlap with the multiplayer) and how involved you want the client to help you in your multiplayer matches (from enabling/disabling your mouse from clicking on enemy units to auto-gathering your workers at the start of the game). In addition, your profile card is also both concise and expanded in various menus and the rewards in playing multiplayer matches is displayed through your profile picture, experience and levels as well as interesting skins for your units and animations (dancing and such). The UI for spectator mode can also be customized for tournament organizers, removing the unnecessary graphics for the spectator and delivering more essential information to better view progaming matches. Everything is slick and smooth in navigating through Battle.net and a major improvement from the previous version where a lot of empty areas were brimming with potential use. The UI is sleek, attractive and concisely informative. Everything is available either in a drop-down menu or through sectioned menus. 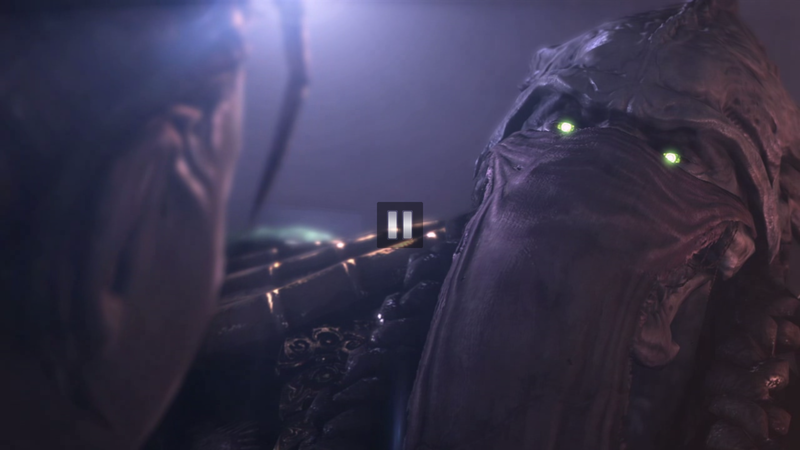 StarCraft II: Heart of the Swarm delivers a lot to those already in love with the series. Tutorials, challenges and custom games also hold onto players who love the game more than for its competitive ladder and leagues. Its aim to create new ways to connect and cooperate with others through groups, clans, resume from replays and more really lessen the secluded and sometimes frustrating tone of the game and expand its options. 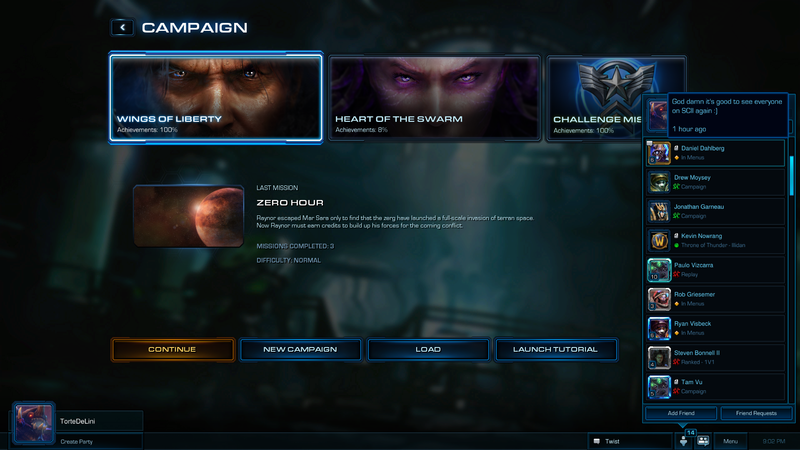 However, there is still much more to be done with the game story-wise as well as within the UI, StarCraft II: Heart of the Swarm is off to a great start and appeals to the expectations of many people who started with StarCraft II back in 2010 and perhaps regain those who have given up on the series and E-Sport. There are many minor features not elaborated in this review that you’ll come to appreciate (like end-of-match reports and statistics, map info/screenshots/patch notes/review, concise friendslist, etc. ), but in short, Heart of the Swarm is definitely worth its cost. In comparison to Wings of Liberty, it does not feel short for an expansion. As a series on its own, it feels complete, but could still use additions in regards to team-games/FFA (balance & better maps), dialogue/story as well as qualities like team matches, or qualities found in WarCraft III like daily/weekly tournaments and chat features. Nonetheless, if you love Real-Time Strategy games and pine for a compelling singleplayer, advanced multiplayer to really devote your time and energy in improving yourself: StarCraft II can feel very rewarding for the competitive fan.